I love it when I have the chance to give students a project that allows their creativity to run wild. 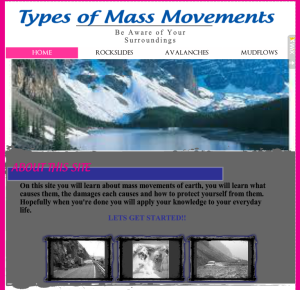 Recently the students of Earth and Environmental Science built websites intended to educate the public about the dangers of mass movements. I had many fantastic submissions (a couple of which you can see on the Hall of Fame page), but there were two in particular that I wanted to highlight with their own post. Click on the screenshots to visit both fantastic sites.